Have you ever wanted to do something scary, something totally out of your comfort zone? Or have you watched others do something like going skydiving and told yourself that you could never do such a thing? That was me. 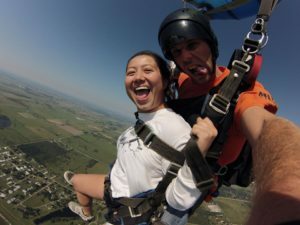 I was terrified of heights and never once did I ever see myself going skydiving, but I did and here is the story of what lead up to it. The countdown to age 18! I was born in Korea. When I was 9 1/2 months old I was adopted by an American couple who were Jehovah’s Witnesses. If you don’t know much about the religion, I will tell you that it is a very extreme religion, with lots of “rules”. As a child, I never got to celebrate my birthday or any holiday. Growing up, my life was not what I would call ideal or a happy childhood. My adoption story wasn’t one with a happy ending. Around age 12, I remember counting down the time until I was 18. I didn’t know what I wanted to do or what I was going to do. I just couldn’t wait to get away from them, the abuse and their control. The days, the weeks, the months, the years slowly passed. I finally couldn’t take it any longer and at age 15, I ran away in the middle of the night and never went back. I searched for love, but couldn’t find it and didn’t really even know what real love looked like or felt like. I had been counting down the days until I turned 18. It was going to be a SPECIAL DAY! It meant my FREEDOM! My 18th birthday DID turn out to be a VERY SPECIAL DAY! I received my first birthday present. I found out I was going to be a Mom. I remember as if it was yesterday, the night of my 18th birthday, I was standing in someone else’s bathroom, staring at a pregnancy test with a faint line in a catatonic state. I wanted this, but when it became real, panic and fear set in. I was scared but didn’t want to let on how terrified I was. I didn’t know how I was going to take care of a baby, but it didn’t matter, all I knew was that I was going to be a Mom. I don’t know what I expected to happen. All of my “party friends” ditched me. But I felt alone. When I finally got the nerve to tell my father, he was more than disappointed. When he finally told my mother, her response was that she was surprised I was pregnant because I was too selfish to be a mother. Looking back though, I really wasn’t alone. Ever since the day I had another heartbeat inside of me, I’ve never been alone. I remember thinking, “When my baby is 18, I’ll be 36!” It seemed light years away. Then I turned 36 this year and reality set in. September 10, 2017 – My baby turned 18. It was surreal. It was a bittersweet day. Being a Mom hasn’t been easy. And lord knows, I haven’t been the best Mom. But I did the best with what I had. I have always said that Haylie and I grew up together. I’ve made my fair share of mistakes as a parent. Even though I’ve doubted myself and been shamed by my parents, I take a look at my girl and I couldn’t be more proud. 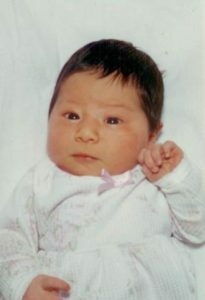 It’s insane just how fast the first 18 years of her life flew compared to my first 18 years. She’s nothing like I was at 18, but exactly like me. She’s my mini-me. She’s my first blood relative. She’s the one who taught me how to love. She’s the one who’s always showered me with unconditional love. She’s the one that made me believe you could love someone more each day. She’s the one who taught me how to be a Mom to her siblings. She’s the one who’s been with me the longest in my life. And she’s the one who gave me a “family”. When Haylie was 14, she told me that she wanted to go skydiving for her 15th birthday. I told her point blank, “I will pay for you, but I am not going.” She and Ryan (my husband, her step-father) decided they would go together. So I made some calls to schedule it for her birthday. I quickly found out that you must be 18 to skydive. When I told her, she was disappointed but started her own countdown ’til her 18th birthday. I 100% believed that she would change her mind. I 100% believed that as she got older, reality and then fear would set in and she would “chicken out”. Ryan kept telling me that she wouldn’t. 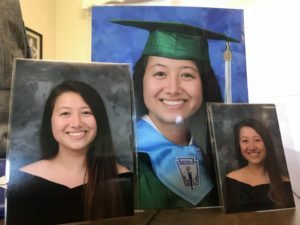 Apparently, I forgot that I had been raising my children to be fearless because the last thing I wanted, was for them to be like I was as a teen, young adult into parenting — controlled by fear. Ryan being the adrenaline junkie that he is has had a major impact on my girls and taught them to try new things and our son has been a fearless daredevil since he could walk. As her 18th birthday got closer, I kept asking her if she still wanted to go. She said yes. I told her about 6 months out from her birthday that I was going to go to. She and Ryan did not for one second believe that I would actually do it. About 2 months before her birthday I confirmed that she still wanted to go and she indeed wanted to go. So I made reservations for the 3 of us at Skydive Houston for the morning of her birthday. Fear is debilitating. Fear is the thief of joy. This video really inspired me to just jump. I was shocked that I wasn’t totally terrified the days leading up to it. I surprised myself. I was calm. I was committed. The whole idea of going skydiving TOGETHER ON HER 18th BIRTHDAY felt so monumental to me. It has been extremely hard for me to put it into words, but the experience was symbolic. It felt like the most incredible way to celebrate that WE DID IT! WE MADE IT! My biggest fear as a Mom was that my children would turn out like me. But considering that I was staring at a pregnancy test the day I turned 18, and Haylie and I were jumping out of an airplane together on her 18th birthday I think it’s safe to say that she is nothing like I was at her age. 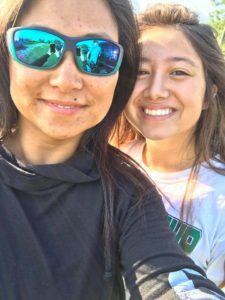 When my girls were young, before I found my passion for fitness and coaching, I worked full-time, working crappy, low-paying jobs, where I felt underappreciated and unimportant. I always gave 110% to my employers, hoping that one day it would pay off. I sacrificed a lot hoping that one day I would be appreciated, but it never did. Working for someone else’s dream never paid off for me. It never gave me a sense of fulfillment or any satisfaction. I worked hard, for low pay, no recognition, no raises, no time off and the worst part, that I was riddled with guilt over, is the fact that I never got to be present for my kids. I missed their school functions. I never got to go on field trips. They went to daycare after school. Someone else took care of them when they were sick. It made me sad. It made me angry. So when the time came to actually set up Haylie’s skydiving I made the decision to go with her. Too many experiences and memories in her life were with someone else who was filling my shoes while I worked. This was something she really wanted to do. This was something she had wanted to do for a long time. And I felt like this was my last chance to be FULLY PRESENT and not have someone else stand in my place. Sure she would have been totally happy with going with just Ryan and her, but I felt so compelled to not sit this one out all because of fear. Facing your fears is scary AF…but what a rush! I know I can conquer anything! And most importantly my kid knows I can and will and she can too! I wanted to prove to her that I would do anything for her and I wanted to prove to myself that fear is a lie. I truly can’t even begin to fully describe what it felt like …. 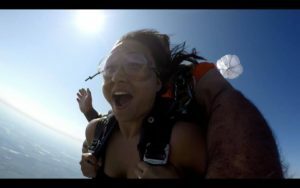 the ride up to 10,000 feet, seeing that plane door open, seeing my daughter jump out, jumping out myself, free failing for 30 seconds, feeling the parachute open, dangling thousands of feet above ground and finally landing, putting both feet on the ground. But what I can tell you is that I realized that there is truly nothing I can’t do. 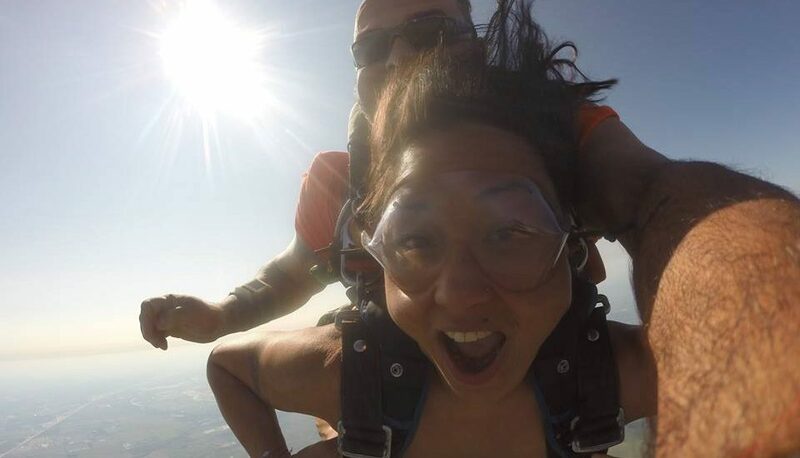 It took a split second to decide to go skydiving. Not because I wanted to, but because I had a compelling reason that made it worth it. It took a split second to get on the plane. It took a split second to step out of that airplane. We survived. I survived. And at the end of the experience, I felt empowered and unstoppable, which is one of the best feelings. I have been terrified of heights since I was a small child. 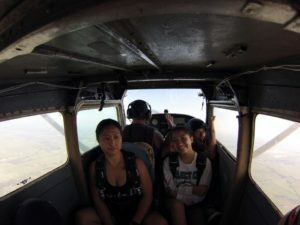 I have never liked flying in small planes and I never thought I would jump out of an airplane, but I did and it was an amazing experience that I will never forget. 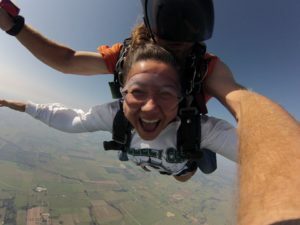 Jumping out of the plane and descending down to the ground was not nearly as scary as the plane ride up to 10,000 feet, but that is just me. I have had an irrational fear of heights for a long time, but like Ryan said, skydiving is not as dangerous as I made it out to be. He said, “Think, the skydiving instructors are in the business to stay alive. They are going to do everything to keep you and them alive!” When he changed my perspective and made a great point, my fear drastically decreased. ** If you ever want to go skydiving in Houston, go to Skydive Houston and be sure to get Kip as your instructor! He is awesome! We have become friends with him. He is experienced and has a great personality! 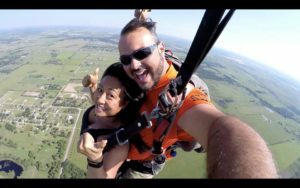 Click here to get a deal on Groupon for tandem skydiving for 1 or 2. If you are reading this, we should connect on Facebook or Instagram.